Our nurse practitioners (NPs) and physician assistants (PAs) work closely with our physicians to ensure that all of our patients receive exceptional team-based dermatologic care. We maximize access to excellent care through shared appointments with a physician and a close working relationship between NPs/PAs and our physicians. Our goal is to give our patients as many options for care as possible, while also maintaining high quality of care standards. The NP/PAs complement, but do not replace, our physicians in their care for our patients, and are a key component of our team. Katie Piccoli, MSN, CRNP is an adult nurse practitioner with a focus in dermatology. She graduated from the University of Maryland School of Nursing where she received both her Bachelors and Masters degrees. After receiving specialized training at the University of Maryland Department of Dermatology, Katie has provided care for patients in private dermatology practice for more than 10 years. 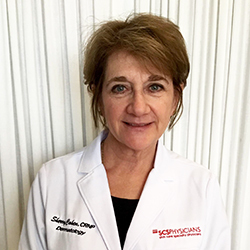 She is certified as a nurse practitioner through the American Nurses Credentialing Center and is a member of the Nurse Practitioner Association of Maryland and the Dermatology Nurses Association. Sherry Guralnick Cohen, CRNP received her Master of Science and post master’s certificate from University of Maryland School of Nursing. She is certified as a Family Nurse Practitioner and has more than 20 years of experience in Dermatology. She has worked at the University of Maryland Medical Center, Baltimore City Hospital, Johns Hopkins Hospital and University of Pittsburgh Medical Center. From 1997-2006 she worked at Johns Hopkins Hospital in Dermatology in clinical practice and research. She was the study nurse coordinator for multiple dermatological studies. Since 2006 she has worked in private practice in dermatology. Her practice includes medical, surgical, and cosmetic dermatology. She has a special interest in psycho-cutaneous medicine. 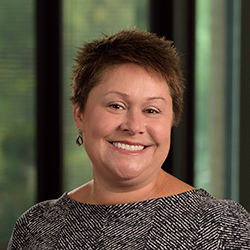 Sherry has teaching experience as a Faculty Associate with University of Maryland Graduate School and Clinical Instructor in Clinical and Epidemiology and Preventive Medicine at University of Pittsburgh School of Medicine. She has published in Advances for Nurse Practitioners and contributed a chapter to Pediatric Dermatology. Professional affiliations include Nurse Practitioners Association of Maryland, Dermatology Nurses Association, and American Academy of Pediatrics. Megan Quinn, PA-C is a dermatology physician assistant. She graduated from Loyola University Maryland with her Bachelor of Science. 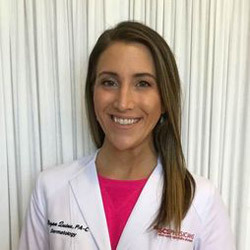 After graduating from Loyola, she worked as a medical assistant at Skin Care Specialty Physicians before obtaining her Master of Science degree in Physician Assistant Studies from Drexel University, Philadelphia. She is certified as a physician assistant through the National Commission on Certification of Physician Assistants and is a member of the Society of Dermatology Physician Assistants. Native to the Philadelphia suburbs of southern New Jersey, Megan is excited to call Baltimore her new home as she rejoins SCS Physicians as a PA! 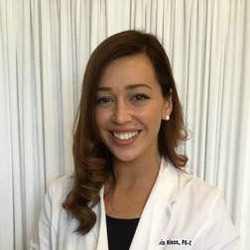 Caitlin Riess, PA-C is a physician assistant with a focus in dermatology. She worked as medical assistant for Skin Care Specialty Physicians during her undergraduate studies at Towson University, where she achieved her Bachelor of Science. After graduating, she pursued her Master of Science degree in Physician Assistant Studies at the Towson/CCBC program. She is a Certified physician assistant through the National Commission of Certified Physician Assistants and is a member of the Society of Dermatology Physician Assistants.